Chinese Gourmet offers a full Menu in its sit down Restaurant where you can enjoy a very personal service, call the above phone numbers to Book or simply call in during opening hours. Chinese Takeaway in Oldcastle Meath offers both a delivery and collection service (confirm delivery times before ordering). Special Meal Deals begin at this Chinese Gourmet from €10 per-person, for €10 you can enjoy a Starter, Main Course and can of soft Drink. Choose starters from spring roll, spare pork ribs in BBQ, Sweet and Sour or Honey sauce, Chicken Wings with salt chilli peppers, BBQ or sweet and sour sauce, smoked chicken with salt chilli and pepper, chicken satay skewer or sesame prawn toast. 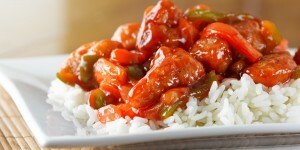 Any of the Chicken, Beef or pork dishes on the main menu served with boiled or fried rice, or chips. Coke, 7up or Club orange are available with your Meal Deal at Chinese Gourmet.